​The Alaskan Way Viaduct closed at midnight Friday, kicking off what’s expected to be a two-week shutdown while Highway 99 tunnel machine Bertha burrows below. Check back with us here for updates on the day’s commutes, in which the traffic jams started early and in some places haven’t eased much. 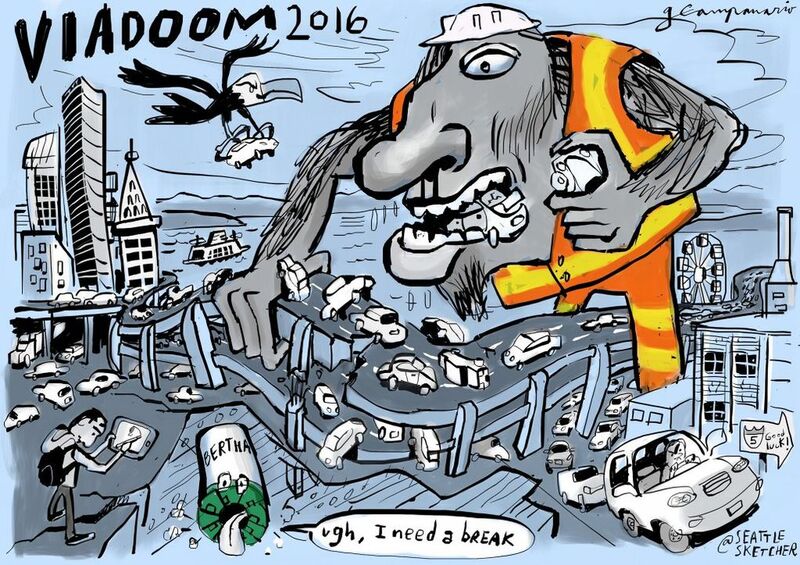 Below is the breaking account of the first day of the Highway 99 Alaskan Way Viaduct closure. Click here for our wrap-up of the day’s events and a guide on getting around without the viaduct. It’s the first big commute day during the two-week Alaskan Way Viaduct closure. Some folks are starting shifts earlier or working from home to avoid the traffic. If that’s not you, and you haven’t planned out your routes yet, here’s a user’s guide to not using the viaduct. 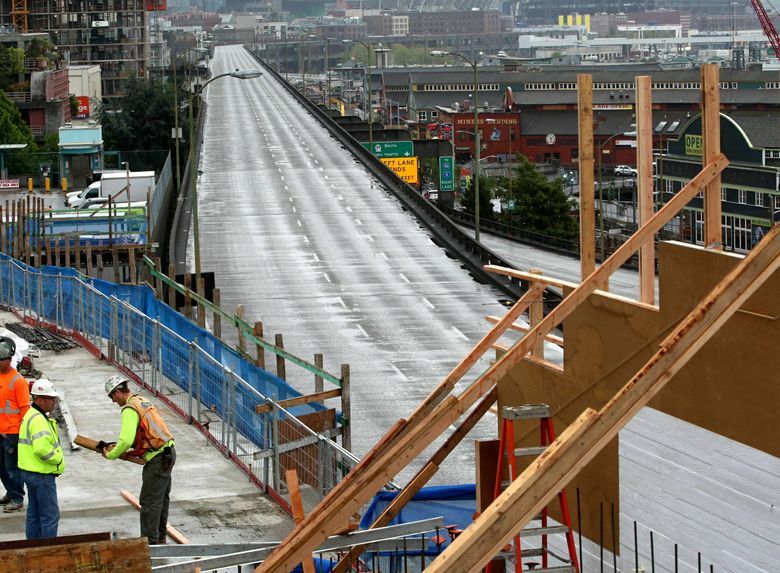 We highly recommend checking it out (remember what happened last time the viaduct closed?). Is the viaduct closure affecting your work or your business? Tell economy columnist Jon Talton about it. Marysville is the place to avoid for the next few hours, as early-afternoon travelers find themselves delayed for miles. Traffic is at a near standstill all the way from 128th Street Southwest, through Everett, and to downtown Marysville – largely because of Washington State Department of Transportation (WSDOT) construction-staging decisions. The merge from Highway 529, near the Snohomish River, is more abrupt than usual because of temporary restriping, as well as a concrete barrier, on the freeway bridge nearby. The state expected a chokepoint there, and it’s compounded by the fact that commuters and weekend travelers started earlier than usual, even for a Friday. 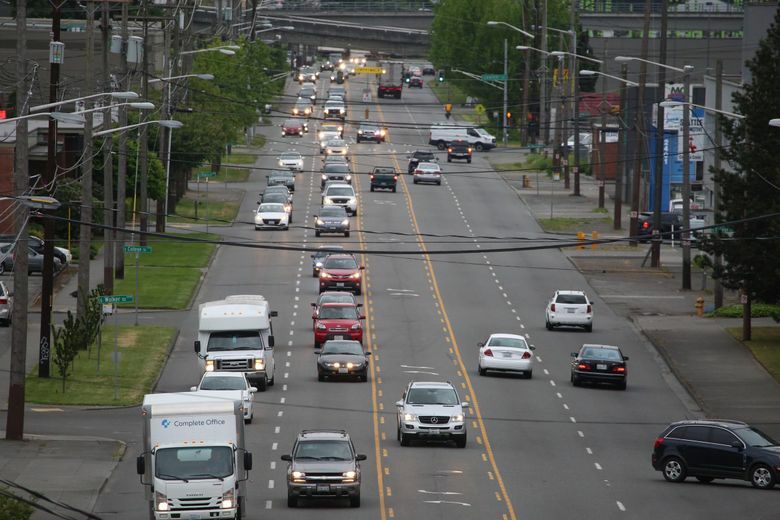 The road striping was changed to prepare for expansion-joint repairs in the coming week, said Danielle Holstein, spokeswoman at the WSDOT control center in Shoreline. Freeway traffic has also been stop-and-go in Kent, Marysville, downtown Bellevue and North Seattle most of the afternoon – and just worsened because of an incident, including a medical response, blocking the right lane of Interstate 5 under the state convention center. Traffic since the morning commute never did clear out from the Ship Canal Bridge or the Renton S-curves, which set the stage for a bad afternoon. Otherwise, most of the regional highway network looks normal. In a bad omen for the Friday afternoon commute, traffic entering Seattle has been heavy since the morning rush, both on the I-5 Ship Canal Bridge and at the Renton S-curves. This means that when Mariners fans, reverse commuters and circulating transit buses show up in the next couple of hours, they’ll brake to a halt in North Seattle, and the online traffic maps will show another black bloc of gridlock. 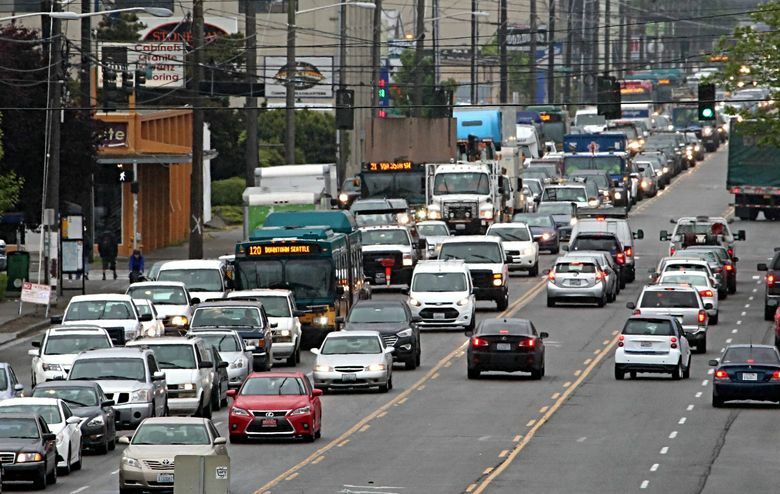 Mark Hallenbeck, director of the Washington State Transportation Center, has talked about the early-afternoon predicament for years, noting that traffic piles up around Northgate earlier and earlier, even on a normal day. Morning traffic on northbound I-5 peaked with a 6-mile backup between 7 and 10 a.m.
King County Metro Transit, which has 11 extra buses in affected areas, says it added trips on the C, D, 120, 125 and 131 routes to assure that riders were picked up on schedule despite heavy traffic. For those coming downtown from West Seattle, late-morning commutes took about an hour. West Seattle water-taxi ridership tripled, but plenty of space was still available on the boats and no passengers were left behind, Metro spokesman Jeff Switzer said. But chances are the crowds will increase next week, he said. 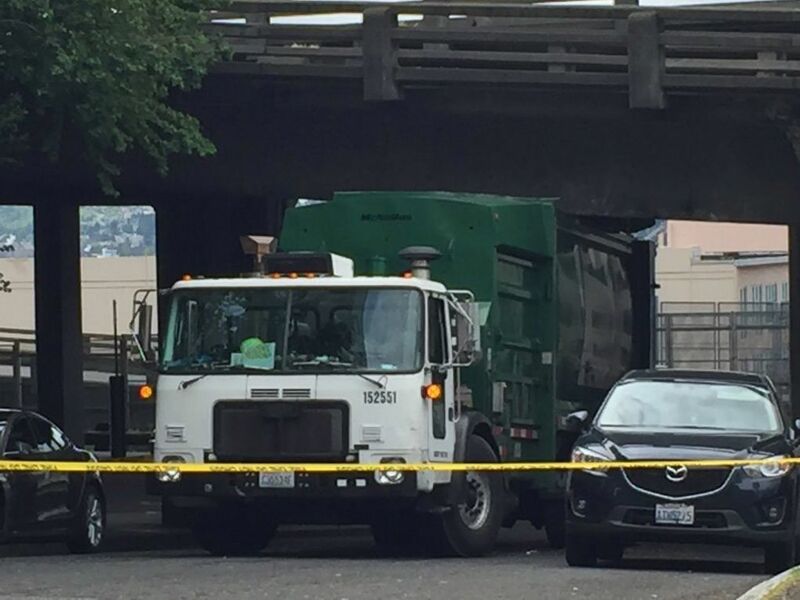 A garbage truck hit the viaduct around noon, causing police to block off a few blocks to cars and pedestrians in Belltown. 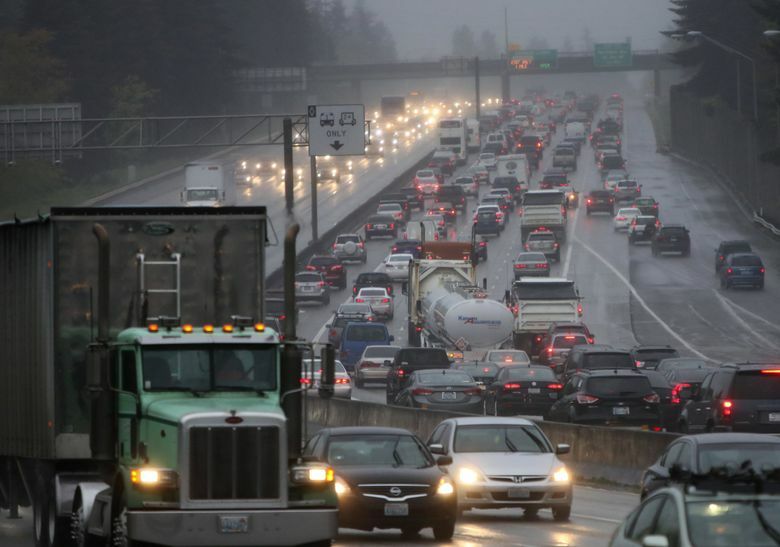 Just as traffic seemed ready to subside, a new crash was reported on I-405 near Southcenter, where the entire Renton area remains in stop-and-go congestion. Traffic is still jammed on I-5 from Beacon Hill to downtown. Bus and car travelers from West Seattle were still reporting hourlong trips at 10 a.m., including lineups extending uphill to the Admiral District. A small number of bus riders on clogged Fourth Avenue South diverted onto Link light-rail trains when surface traffic became sluggish, and at least one train filled up. Sound Transit reported excess capacity earlier Friday. Aurora Avenue North: Southbound drivers couldn’t continue past downtown due to the viaduct closure. The delay was less severe than usual — but, surprisingly, southbound traffic from Highways 599 and 509 was lighter than normal, too. It appears that drivers diverted early to I-5 or other bypass routes instead of crossing the First Avenue South bridge into the Duwamish boulevards, said DKS principal Eric Shimizu. A drive down Aurora at 9:30 a.m. was comparable to an easy Saturday, and no backups were seen for drivers who continued into the Battery Street Tunnel to the Belltown exit, at Western Avenue. Eastside: Traffic from Issaquah toward Bellevue and Seattle was worse than normal, Shimizu said, but the I-90 floating bridge avoided severe jams. He said he suspects that drivers avoiding Seattle went to I-405 instead, slowing things down at the I-405/I-90 junction. That’s logical, considering the downhill weaves and delays that often show up between Eastgate and the Mercer Slough. Snohomish/North King County: The DKS analysis, based on Google data, confirms WSDOT traffic maps that showed prolonged stop-and-go conditions in Lynnwood and Bothell as early as 6 a.m. The so-called “SnoCoSqueeze” resumes at 9:30 p.m. Friday night, where lanes will gradually be reduced northbound to only one lane overnight, then two over the weekend. The corridor will provide three narrow lanes on weekdays, starting Monday. And overnight lane closures are planned on I-90 in Issaquah to repair the Front Street overpass damaged by a tall garbage truck 14 months ago. 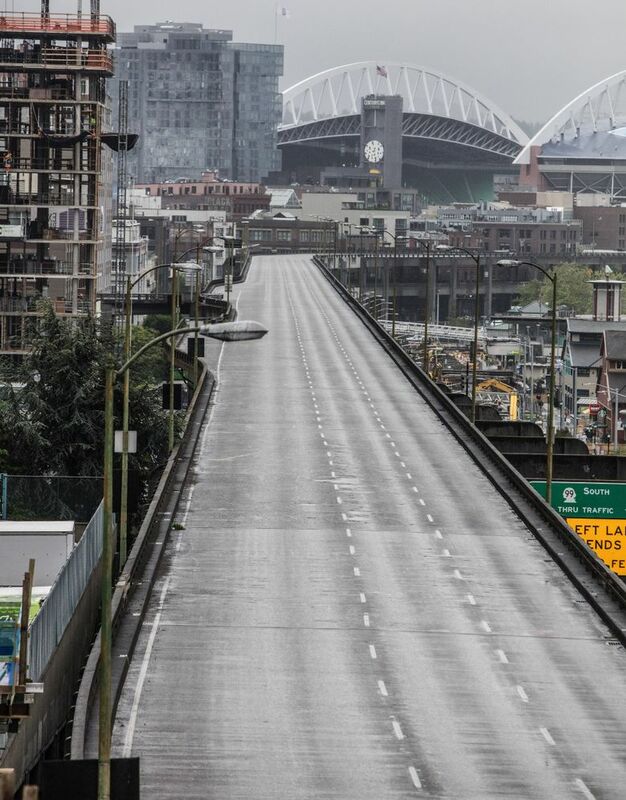 Many highways remained clogged at 10 a.m., following rain squalls and the first day of the estimated two-week closure of the Alaskan Way Viaduct. Twitter users have given mixed reviews of the commute. AAARRRRGGGGHHHHH #VIADOOM!!!! IT BURNS!!!! MAKE IT STOP!!!! #viadoom? That was the easiest commute I've had since I worked from home. It appeared the commute was winding down early, but rain and another surge in travel have kept congestion on the streets. A West Seattle driver reported 70 minutes from home to Ballard, using waterfront streets. Light rail: Unexpectedly, there’s been enough room on some of Sound Transit’s Link light-rail trains for everybody to have a seat, said spokesman Bruce Gray. Trains arrive every six minutes at peak, and are currently running 10 minutes apart, from Seattle-Tacoma International Airport to downtown and the University of Washington. Park-and-ride space is filled now at Tukwila International Boulevard Station, but bus riders might save time getting out on Fourth Avenue South and walking to Sodo Station, where Link continues north free from gridlock. Buses: King County Metro Transit reports bus delays entering the city, despite traffic cops helping move traffic where Spokane Street meets Fourth Avenue South. Amanda Kay Helmick, commuting from White Center, said her Metro 113 bus sailed easily through the Sodo busway on its detour route. Water taxis: The water taxi was “a breeze,” tweeted Seattle City Councilmember M. Lorena Gonzalez. Ridership is higher than usual, but nobody has been turned away from a boat so far, Metro says. Sure is peaceful on the Waterfront with the #99closure. 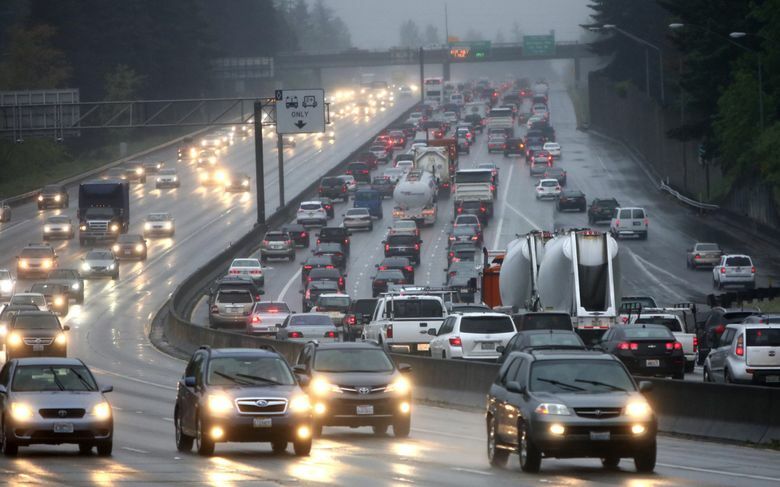 Travel times have ranged from normal to about 30 minutes longer than a typical Friday, WSDOT spokesman Travis Phelps said. Traffic usually peaks from 7 to 8 a.m., he said. Today it peaked around 8 a.m. and now seems to be trending downward, he said. “It looks like a lot of folks shifted their commutes early today,” he said. North End: One of the better performers today is Aurora Avenue North, of all places, where it took only 30 minutes to drive from Shoreline to South Lake Union just now. It seems that drivers going through downtown are off Aurora, so a trip into downtown today compares to any other rainy morning. The viaduct closure has made Friday morning more pleasant for Belltown resident Dustin Akers, who says he walked his dog, a collie-German shepherd mix, along Western Avenue — usually a hectic car pipeline between Interbay and the south end — to the Olympic Sculpture Park. “This morning, there’s not a single car, which is great,” he said. Akers expects an easy reverse commute to Lynnwood this morning. But in the afternoon, returning from Lynnwood to Seattle is normally very slow. That’s likely to be especially true today, with an evening baseball game in Sodo adding slowdowns to the usual Friday impatience. South End: In Sodo, Fourth Avenue South is finally jamming. Seattle Department of Transportation live video shows cars rolling through the Lander intersection at less than 20 mph. It might be time for bus riders to try bailing out at Lander and walking over to Sodo Station, where Sound Transit reports ample room on the Link trains. Two additional rail cars are being added to the fleet this morning so that four of the 15 trains can reasonably carry 450 people each, or 600 in crush conditions. Freeways: Travel times on the freeways have improved slightly in the last half-hour, but still a drive from Everett into Seattle requires 61 minutes. Generally speaking, congestion followed a typical morning pattern today, except bottlenecks formed one hour earlier than usual. There have been only a couple of minor crashes, so much of the delay results simply from waves of abrupt merging and braking that can spread for a mile or so — known as “deceleration waves.” WSDOT incident teams responded to two lane-blocking crashes this morning, both on I-5, Phelps said. If you’re heading from Everett to Bellevue right now, it’ll take you about 67 minutes. You can check other travel times here. One maneuver worth trying today for North End commuters is a slow trip through the Battery Street Tunnel and exiting at the short, rarely used Western Avenue offramp. The Seattle Department of Transportation (SDOT) is letting one lane through the tunnel there as an experiment to relieve pressure at the larger Denny Way exit. But there was some confusion this morning over unclear road signs, prompting the city to close the tunnel for a few minutes and move its orange barrels around. “Just before 7, we wanted to adjust the control devices in the taper area,” SDOT spokesman Norm Mah said. Now the route should be more obvious, and signs mention it on Aurora near Queen Anne Hill. Traffic to that exit has been light, but can be expected to thicken as drivers learn about the exit during the two-week disruption while tunnel boring machine Bertha digs the next 385 feet beneath the Alaskan Way Viaduct at Yesler Way. Meanwhile, for this closure to be over as quickly as intended, Bertha needs to grind at full speed — an average of 30 feet forward daily, totaling 385 feet. A barge has docked at Terminal 46 to move tunnel muck quickly to a quarry near Port Ludlow, across Puget Sound. The WSDOT and Seattle Tunnel Partners finally reached agreement on a barging restart plan, after a barge tipped Jan. 12 and spilled some soil into Elliott Bay. For today, trucks will carry tunnel muck to an approved landfill that can take contaminated soil, since the first 10 feet of tunneling will go through a concrete block where Bertha was parked for maintenance in April. First Avenue South is clogging through Sodo, and a stalled truck near Atlantic Street has made the situation worse. The West Seattle Water Taxi just departed with 180 passengers, which still leaves room for 100 more, the West Seattle Blog reports. The C Line bus detour to Fourth Avenue South worked well. The 6:30 a.m. bus was packed, which normally doesn’t happen until 60 to 90 minutes later. The bus cruised all the way through downtown to South Lake Union with only minor delays near the stadiums, said Seattle Times book editor Mary Ann Gwinn, who rode it to the newsroom this morning. Freeway traffic is about 10 minutes slower than average going south. Alderwood to Southcenter is 55 minutes on I-5 and 58 minutes on I-405, WSDOT is tweeting. Just east of Everett, a driver was going in reverse on Highway 2 at the wetlands, causing delays and hazards for everyone else driving west on the two-lane viaduct into Everett, a WSDOT video clip shows. The southbound I-405 toll was at $10 around 7:30 a.m. near the I-5 interchange. Don’t forget the Mariners play at 7:10 p.m., which could complicate the already crowded Friday evening commute. It could be a big crowd at the ballpark, given that it’s College Night and Beard Hat Night, rapper Macklemore is throwing the first pitch, and the M’s are facing the defending World Series champion Kansas City Royals. Plan accordingly. WSDOT’s new traffic management center in Shoreline opened last fall. 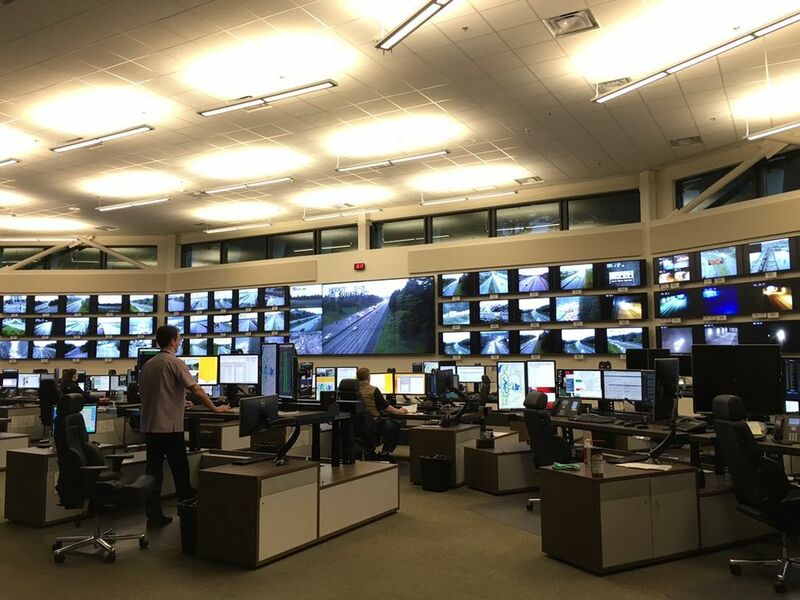 Traffic engineers are able to monitor about 850 video feeds on 120 monitors that stretch across a wall about 100 feet long. About a dozen people were monitoring the roadways at the center Friday. WSDOT monitors police and fire department radio chatter and dispatches, to send road-clearing incident management teams. WSDOT spokesman Travis Phelps said the agency is in constant communication with the Washington State Patrol and helps troopers find wrecks that have been called in using the video monitors. “Part of what this room does — it helps locate things for law enforcement,” he said. Phelps said the agency also coordinates with towing companies, with the goal of clearing wrecks in an hour and a half as long as police do not need to investigate. About 12 incident response crews are available for WSDOT to send to clear wrecks, Phelps said. Looking good on Link this first morning of #99closure. We're monitoring loads on every train and are seeing spare capacity. Three major slow spots have emerged: Alaskan Way near the waterfront, southbound I-5 from Lynnwood to Northgate (where rain, not the viaduct closure, appears to be the culprit), and northbound I-5 south of I-90. The congestion started at about 5 a.m., which suggests people started their commutes earlier. The state Department of Transportation has a traffic management center set up in Shoreline, where about a dozen people are monitoring the roadways today. They also keep an ear on police and fire department radio chatter and dispatches, to send road-clearing incident management teams. About a dozen such teams are available this morning, agency spokesman Travis Phelps said. They’re reporting no major incidents so far. Phelps said the agency’s goal is to clear wrecks in an hour and a half, so long as police do not need to investigate. Traffic is heavier on Alaskan Way and on Interstate 5 south of Interstate 90. Friday afternoon commutes tend to be rougher than Friday mornings, Phelps said. Rain showers are arriving in the convergence zone near Lynnwood, a bad omen because of the risk of spinouts and fender-benders. The chronically cluttered area between 164th Avenue Southwest and the I-405 junction has been stop-and-go for about 45 minutes, but southbound I-405 seems reasonably fast except for a short stretch in Bothell. The Renton S-curves of I-405, and Highway 167 in Kent, also show slowdowns on the traffic map, not an unusual situation. The state Department of Transportation is reporting that while Friday is typically a light traffic morning, volumes are heavier than usual today. A trip from SeaTac to Seattle is 30 minutes, about twice as long as it takes when driving the speed limit in no traffic. West Seattle commuters are lining up already to try the water taxi to downtown, which is providing expanded park-and-ride lots, while West Seattle Bridge traffic is mounting but still stable. And in the past few minutes, Sodo streets have been filling up, especially First Avenue South. Nearby Fourth Avenue South is flowing, though — it effectively has four inbound lanes available due to parking bans, which is a favorable situation for thousands of bus riders who are detouring through there. In the University District, the Seattle DOT reports a crash on westbound Northeast 45th Street near University Village. 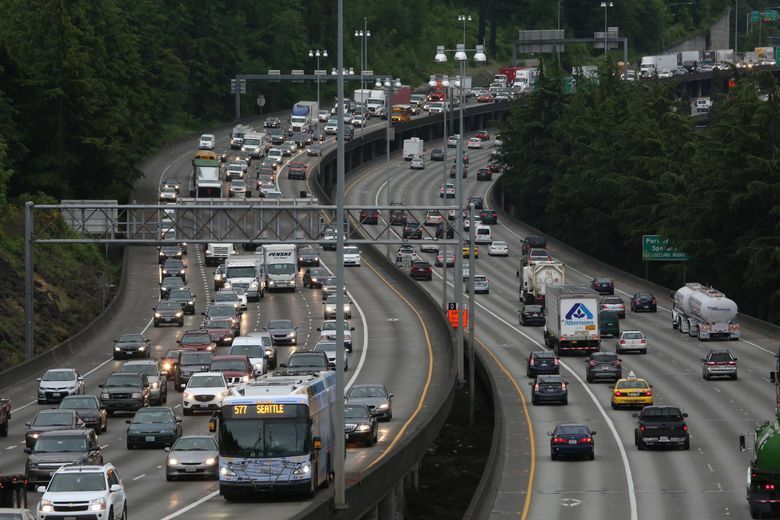 The classic Seattle-area traffic slowdowns are quickly forming, an hour earlier than usual. It’s stop-and-go from 164th Street Southwest to the I-5/I-405 junction, as well as in the Southcenter area, at the north end of Highway 167 in Renton, and on northbound I-5 in Sodo. A couple of minor crashes near Northgate have been cleared to the shoulder, and rain showers in Marysville could lead to spinouts if drivers hurry too much. The southbound HOV lane of Interstate 5 is open to all traffic from Mercer Street to Corson Avenue South. Parking is banned on northbound Fourth Avenue South in Sodo — which means that buses effectively have a fourth lane available along the curbside, all the way to South Holgate Street, if necessary. In case of congestion, transit riders on the C Line and 120, and related buses, can bail out at Fourth and Lander to finish the downtown trip on Link light rail from nearby Sodo Station.